The Roosevelt Lake water level is 58% full. The amount of water being drawn down has slowed in recent weeks which is great news for the overall health of the lake heading into the winter months. 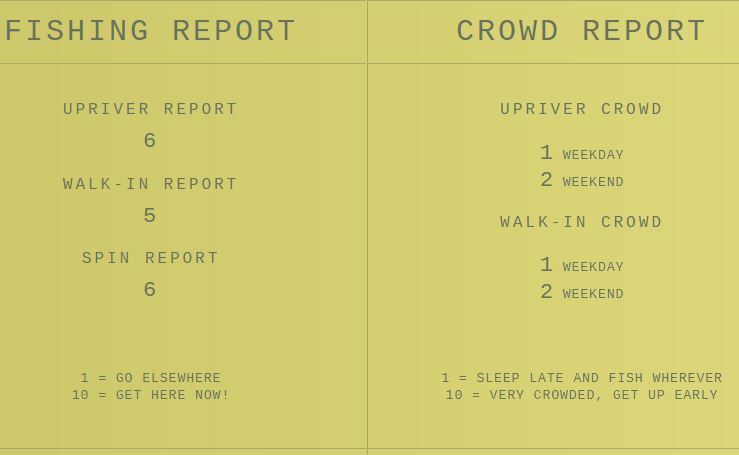 The Salt River flow into the lake has increased recently and is just under 60% of the normal rate for this time of year, however, the Tonto Creek is still not flowing. The water temperature in the lake is in the low 70s in the morning, increasing to the mid 7’s in the afternoon and the water clarity remains very clear. The ambient temperature at the lake is in the low 90’s making perfect fall fishing conditions especially on cloudy days. Bass continue to feed heavily on Threadfin and Gizzard shad on Roosevelt Lake. During the fall, shad will migrate to shallow water at the ends of the lake or into the backs of larger coves. Most any shallow running reaction bait or top water bait will catch good numbers of bass in the 12″ to 14″ range. Examples include Rapala SR5, Super Flukes, 5″ paddle-tail swim baits, buzz-baits, spider-bait and Rio Ricos. If you see a school of shad in shallow water, a great technique is to sit still for several minutes and watch what is happening. If the school of shad is in a panic mode, or if bass are breaking the surface feeding on the shad, get your bait into the water as fast as possible. However, if the shad are lethargic and not in any hurry or there are no bass breaking the surface, most likely there are no bass in that area. Roosevelt Lake crappie anglers are reporting improved conditions. During the recent Bob Hirsch Crappie Tournament, several nice sized crappie were caught. The winners of the “Art Chamberlin Cup” and several other teams reported catching more than 20 crappie during the tournament. Most crappie are being caught in about 20 foot depths and always in cover. The really good news for crappie anglers is that crappie are being caught throughout the lake. 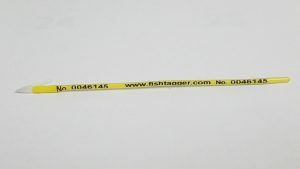 A change in structure or good cover are the keys to locating schools of crappie. A reminder that the daily crappie limit on Roosevelt Lake is 15 crappie per angler. BARTLETT LAKE – Lake elevation is 1,786 feet, feet, 83 % full. Scotter Griffith of The Arizona Fishing Guides said Thursday, Oct. 12 the lake is great for high numbers of largemouth bass with a few big fish being caught. The top-water bite is good all day long in the main lake as well as the dropshot rig off main lake points. LOWER SALT RIVER – On Thursday afternoon, the river was flowing at 546 cfs out of Stewart Mountain. The river is scheduled to be stocked with rainbow trout this week and again the week of Oct. 30. Try nightcrawlers, small spinners, Kastmasters and flies in this unique desert river trout fishery. You might be able to catch some bass or sunfish in the deeper holes. Group of four young anglers (Aidan, Cameron, Dylan, Chelsea) and their morning bounty of trout. Great time fishing again at Woods Canyon Lake! This was my 4th trip this year and had never visited the lake since I moved to Arizona in 2010. Weather: 70s during the day and nice and cool at night in the 50s but not as cold as the prior week (ice was in the dog’s water bowl). Bait/Lures: Secret color/flavor PowerBait and Power worms were the hot ticket with a couple fish on gold Kastmaster and Rooster Tail (white). Fishing is excellent at Show Low Creek at the Show Low Bluff trailhead and Patterson Ponds, which were both stocked with rainbow trout this week. Brown trout are active at the Greer Lakes, Chevelon Lake, and the East Fork Black River. 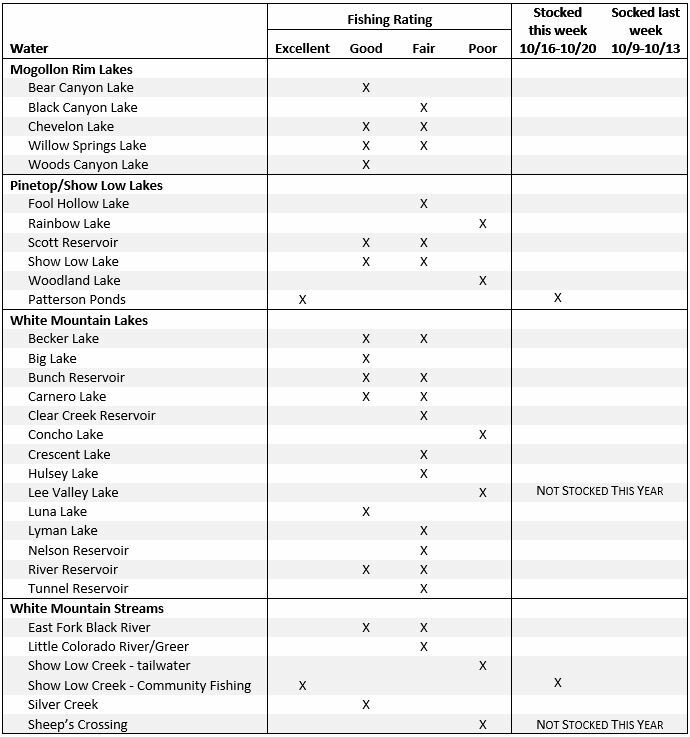 Overall trout fishing is picking up at Big Lake, Luna Lake, Woods Canyon Lake, Willow Springs Lake, and Show Low Lake with the cooler water temperatures. BLACK CANYON LAKE – Fishing is fair. The lake was stocked last in June. Try PowerBait and nightcrawlers. Water temperatures are cooling down and the trout are more active throughout the lake. There is still a bit of an algae bloom. The lake is about 5.5 feet below spill and the new boat ramp is still fully functional. CHEVELON LAKE – Fishing is fair to good for stocked rainbows and wild brown trout. The brown trout should be active and can be caught with Z-rays, Kastmasters, or black streamers. Water temperatures are cooling down and the trout are more active throughout the lake. Chevelon Lake is a hike in lake with a two trout limit and artificial fly/lure only regulations. WILLOW SPRINGS LAKE – Fishing is fair to good for rainbow trout and fair for tiger trout. Try PowerBait with garlic, worms, Kastmasters, or Panther Martin spinners for rainbows. Water temperatures are cooling down and the trout are more active throughout the lake. FOOL HOLLOW LAKE – Fishing is fair for stocked (12”+) rainbow trout! Supercatchable rainbows (12”+) were last stocked in late August. Water temperatures are cooling down and the trout are more active throughout the lake. Fish the mornings for best action with trout. The fishing piers and platforms are accessible. SCOTT RESERVOIR – Fishing is good for catfish. Try chicken livers on the bottom. The lake level is very low and turbid due to irrigation releases. PATTERSON PONDS – Fishing is excellent for trout! Rainbow trout were stocked this week. Channel catfish were last stocked at the end of September. A regular fishing license or a community fishing license is required to fish here. The pond daily bag limits in community fishing waters (2 trout; 2 catfish; 5 sunfish) apply. Please use good catch and release methods if you are releasing fish. BIG LAKE – Fishing is good for lots of small rainbows, with some larger cutthroats. Try flyfishing or lures for cutthroat trout, including crayfish imitations. Brook trout are also in the shallows spawning. LUNA LAKE – Fishing is fair to good. Although there is still a strong algae bloom, the fishing has picked up with cooler water temperatures. Anglers are reporting catching lots of 10-11 inch rainbow and cutthroat trout, and an occasional large cutthroat. EAST FORK of the BLACK RIVER – Fishing is fair to good for stocked rainbows and good for wild brown trout. Rainbow trout were last stocked just before Labor Day weekend, but plenty of stockers are still present. Stocking is done for the year. Wild brown trout are actively spawning. SHOW LOW CREEK COMMUNITY FISHING WATER – Fishing is excellent at this new Community Fishing Water located at the Show Low Bluff trailhead in Show Low. 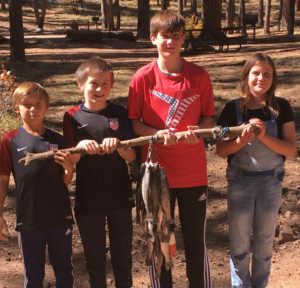 This fishery is a cooperative endeavor by the City of Show Low and Arizona Game and Fish Department to provide fishing opportunities close to home for kids and families. Bait can be used, but daily bag limits are 2 trout, 2 catfish, 1 bass (minimum size 13”) and 5 sunfish. It was stocked again this week through the Show Low meadow from the Bluff trail upstream to the Hampton Inn with rainbow trout. SILVER CREEK – Fishing is good. This fishery changed to the seasonal Catch-and-Release regulations (with artificial lure and fly only with single barbless hooks) on October 1 and will continue through March 31. All trout must be released immediately and please use proper catch-and-release techniques to ensure the trout survive after swimming away. The upper section is now open. Large rainbow trout were stocked on October 1 throughout the stream, including the big pool at the upper end. Michael W.: October 12, 2017 — Another Fun Day Of Fishing For Pike! In 5 hours, I caught & released 2 Northern Pike… A 30″ & 24″… Both Pike were caught on Mepps Double-Blade Agila. Weather Conditions: Sunny & windy, winds 9 to 14 mph with gust up to 31 mph Water Conditions: Heavily stained with volcanic ash.